Record Breakers and proud of it! Berry Bros. & Rudd Spirits is delighted to announce sponsorship of a world record-breaking Burns Night Supper, by The Glenrothes Single Malt Scotch whisky. The record-breaking Lord Provost’s Burns Supper 2015 was hosted by Glasgow’s Lord Provost Sadie Docherty and raised more than £102,000 for charity. It was held at the city’s Thistle Hotel, Glasgow on Friday 23rd January. The Glenrothes was proud to be approached to become the official spirits sponsor of this prestigious charity event by the Lord Provost’s and International Office. The evening provided the perfect platform to officially launch The Glenrothes’ newest expression – Vintage Reserve – in Scotland. An impressive 645 guests attended the event making it the biggest Burns Night Supper ever recorded. Mark McKinley, from Guinness World Records was present on the night to announce this achievement formally. The Lord Provost was joined by broadcaster Paul Cooney, Former Managing Director of Capital FM who was the Master of Ceremonies for the evening and Natasha Raskin of McTears auctioneers. Entertainment was provided by an array of artists; headlining the event was former River City actress Libby McArthur who played Gina in the popular BBC soap. She replied to the Toast to the Lassies. The Toast to the Lassies was given by retired Glasgow lawyer Bill Copeland: Acclaimed singer and clarsach player Gillian Fleetwood made a return visit to the Burns Supper, and there were music and songs from the up and coming Ayrshire teenager Laurie Withers. Additional entertainment was provided by Musical Theatre students attending the Dance School of Scotland. Kathryn Ronney gave an outstanding address to the Haggis and Matthew Wilson brilliantly recited two Burns poems. All monies raised from the night will go to the Lord Provost’s Malawi Fund, the Lord Provost’s Charity Funds and Bobath Scotland, a Scottish charity devoted to improving the quality of life for children and adults with cerebral palsy. 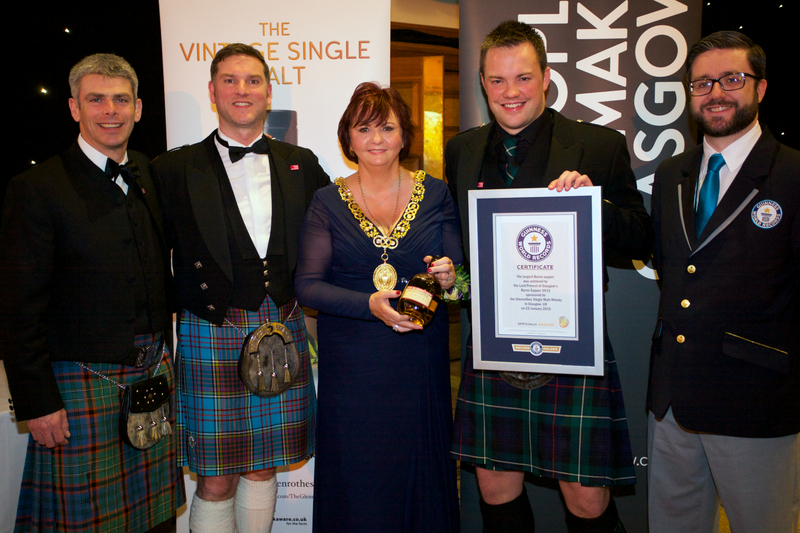 The Lord Provost said: “I’m thrilled my Burns Supper proved to be a record-breaker on two counts.